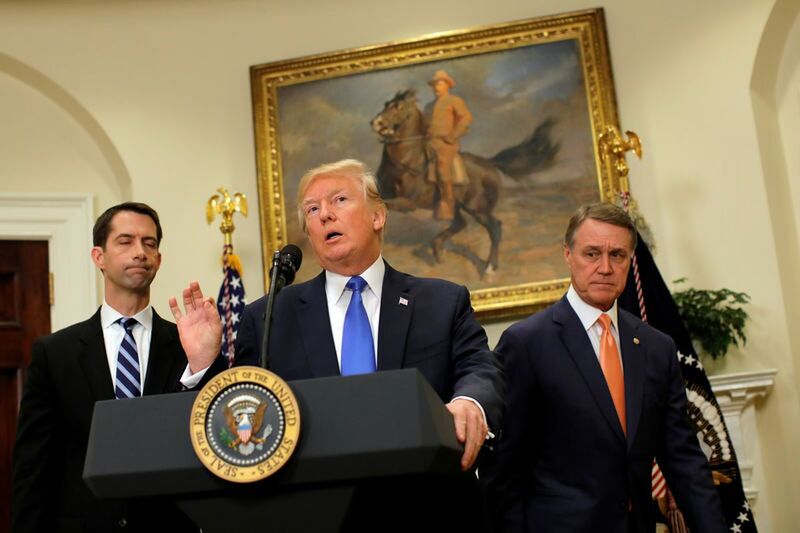 WASHINGTON – President Donald Trump on Wednesday endorsed a new bill in the Senate aimed at slashing legal immigration levels in half over a decade, a potentially profound change to policies that have been in place for more than half a century. Trump appeared with Republican Sens. Tom Cotton (Ark.) and David Perdue (Ga.) at the White House to unveil a modified version of a bill the senators first introduced in February to create a "merit-based" immigration system that would put a greater emphasis on the job skills of foreigners over their ties to family in the United States. "Among those who have been hit hardest in recent years are immigrants and minority workers competing for jobs against brand-new arrivals," said Trump, flanked by the senators in the Roosevelt Room. "It has not been fair to our people, our citizens and our workers." The bill faces dim prospects in the Senate, where Republicans hold a narrow majority and would have difficulty reaching 60 votes to fend off a filibuster. But the president's event came as the White House sought to move past a major political defeat on repealing the Affordable Care Act by pivoting to issues that resonate with Trump's core supporters. Meanwhile, the Justice Department has begun laying the groundwork to potentially bring legal challenges against universities over admissions policies that could be deemed to discriminate against white students. Trump's critics accused the administration of pursuing policies that would harm immigrants and racial minority groups. "This offensive plan . . . is nothing but a series of nativist talking points and regurgitated campaign rhetoric that completely fails to move our nation forward toward real reform," Sen. Richard Blumenthal, D-Conn., said in a statement. Angelica Salas, executive director of the Coalition for Humane Immigrant Rights, predicted that the bill would not go far in Congress and called it "red meat to Donald Trump's base." Trump had met twice previously at the White House with Cotton and Perdue to discuss the details of their legislation, which is titled the Reforming American Immigration for Strong Employment (Raise) Act. Their proposal calls for slashes to family-based immigration programs, cutting off avenues for the siblings and adult children of U.S. citizens and legal permanent residents to apply for green cards. Minor children and spouses would still be able to apply. The bill would create a point-system based on factors such as English ability, education levels and job skills to rank applicants for the 140,000 employment-based green cards distributed annually. In addition, the senators propose to cap annual refugee admissions at 50,000 and to end a visa diversity lottery that has awarded 50,000 green cards per year, mostly to applicants from African nations. Cotton said that while some might view the current immigration system as a "symbol of America's virtue and generosity," he sees it "as a symbol we're not committed to working-class Americans and we need to change that." The number of legal immigrants has grown rapidly since 1965, when lawmakers eased restrictionist laws that had been in place for four decades that largely shut down immigration from Asia, Africa and Eastern Europe. Trump's chief policy aide, Stephen Miller, argued that the system has grown unwieldy, flooding the country with low-skilled workers who drive down wages for Americans of all racial backgrounds, including other immigrants who are already here. Miller sparred with a reporter Wednesday at the daily White House briefing over the symbolism of the Statue of Liberty. He argued that the famous poem by Emma Lazarus was "added later" and thus did not define the U.S. immigration system as offering protection to the "poor" and "huddled masses." "If you look at the history of immigration, it actually ebbed and flowed," Miller said. "There were periods of large waves followed by periods of less immigration." But the legislation was quickly denounced by congressional Democrats, including the Congressional Hispanic Caucus, and immigrant rights groups. It is also likely to face resistance from some business leaders and moderate Republicans in states with large immigrant populations. Opponents of the bill said that immigrants help boost the economy and that studies have shown they commit crimes at lower levels than do native-born Americans. "This is just a fundamental restructuring of our immigration system which has huge implications for the future," said Kevin Appleby, the senior director of international migration policy for the Center for Migration Studies. "This is part of a broader strategy by this administration to rid the country of low-skilled immigrants they don't favor in favor of immigrants in their image." Perdue and Cotton said their proposal is modeled after "merit-based" immigration systems in Canada and Australia that also use point systems. But those countries admit more than twice the number of immigrants to their countries as the United States does now when judged as a percentage of their overall population levels. "Just because you have a PhD doesn't mean you're necessarily more valuable to the U.S. economy," said Stuart Anderson, executive director of the National Foundation for American Policy. "The best indication of whether a person is employable is if someone wants to hire them." Alex Nowrasteh, an immigration policy analyst at the CATO Institute, wrote that the bill "would do nothing to boost skilled immigration and it will only increase the proportion of employment-based green cards by cutting other green cards. Saying otherwise is grossly deceptive marketing." Cuts to legal immigration levels, including some of the same groups targeted in the Cotton-Perdue bill, were included in a comprehensive immigration bill in 2013 that was backed by President Barack Obama and approved on a bipartisan basis in the Senate. But that bill, which died in the GOP-controlled House, would have offered a path to citizenship to an estimated 8 million immigrants living in the country illegally and cleared a green-card waiting list of 4 million foreigners. Groups that favor stricter immigration policies hailed the legislation as a step in the right direction. Roy Beck, president of NumbersUSA, said the Raise Act "will do more than any other action to fulfill President Trump's promises as a candidate to create an immigration system that puts the interests of American workers first."